Acoustic neuromas are slow-growing (average growth rate 1.9 mm/year), presenting at a median age of 50. Patients can present between ages 30 to 50 depending on severity of symptoms.9 Presenting symptoms typically involve dysfunction of cranial nerves V, VII, and VIII, most commonly hearing loss (95%) and tinnitus (63%).9 Despite being the most common presenting symptom, progressive hearing loss is noticed in only 66% of patients who ultimately have hearing deficit.10 This is reflective of the indolent nature of this tumor, often manifesting as irreversible hearing loss in many patients. If left untreated, about 20% to 40% of ANs are stable, either shrinking or ceasing to grow.2 There has been no shown predictive relationship between growth rate and size of tumor at presentation.11 However, patients with a tumor growth rate of 2.5 mm per year have higher hearing preservation than those with faster tumor growth.11 Nonincidental diagnosis depends on patient symptoms, such as hearing loss, which, in turn, is related to the size and location of the tumor. Of note, tumor location is more predictive of hearing loss than tumor size.11 As such, studies have emphasized the importance of early intervention to preserve as much useful hearing as possible.12,13 Treatment options for newly diagnosed acoustic neuroma include observation with serial imaging, surgical management, and radiation therapy. The goal of this review is to discuss the treatment options, expected response, and associated side effects in the management of acoustic neuromas. For patients presenting with hearing loss due to acoustic nerve dysfunction, initial workup includes audiometry to establish a new baseline. These evaluations typically show asymmetric sensorineural hearing loss, usually more prominent in the higher frequencies. Functional hearing is typically described as < 50 dB and > 50% speech discrimination.14 The preferred method for the diagnosis and follow-up of AN is MRI.15 Specifically, diffusion tensor imaging (DTI) is used to assess the auditory tract in the brainstem in those who have sensorineural hearing loss.16-18 Structures to be aware of in treatment planning include the trigeminal nerve, facial nerve, vestibulocochlear nerve, cochlea, modiolus, and brainstem. Thin-slice (1.0-1.5 mm) MRI with gadolinium is recommended to detect tumors as small as 1-2 mm in diameter, revealing an enhancing lesion typically described as “ice cream cone” in the region of the internal acoustic canal (Figure 1) or a “dumbbell” extending into the foramen magnum.19 High-resolution CT scan (with or without contrast) can be used if the patient cannot undergo MRI evaluation. In the event of small tumors (< 2.0 cm) or tumors with no or slow growth without symptom progression — typically either asymptomatic tumors or tumors causing mild, stable symptoms — observation as conservative management is recommended. This includes follow-up with audiometry and MRI every 6-12 months.2 This strategy is also indicated for older patients or those who may not be able to tolerate stereotactic radiosurgery (SRS) or surgical resection.1 The problem with this approach includes ongoing hearing loss during the observation period as well as possible mass effect if the tumor is large or grows during follow-up. With symptomatic tumors, intervention becomes key. Despite these promising findings, there is no international consensus regarding the optimal treatment for AN < 3.0 cm.7 With each treatment option, different risks and benefits are involved, balancing symptom relief with toxicities. Despite the lack of formal guidelines, the literature offers suggestions for optimal management based on various patient and tumor characteristics. Classification systems and scales have been devised and can be helpful in this process.39,40 As outlined below, a thorough review of this body of data can help delineate select populations that could benefit from one treatment over the other. Samii class for tumor classification.ANs are commonly classified according to size or extension. Four stages of AN growth have been described: intracanalicular, cisternal (filling the cerebellopontine angle), brainstem compressive, and hydrocephalic (involving ventricular deviation) (Figure 2A-D).32 A classification based on the extent of tumor growth and presence, and severity of brainstem compression was developed by Samii.41 As tumor location or extension is more predictive of hearing loss than tumor size,11 classification systems such as the Samii Class41 are useful in predicting the rate of facial nerve preservation corresponding to tumor size and anatomic extension.42 The following classes are used to describe tumor location: T1-purely intracanalicular/intrameatal, T2-intra- and extra-canalicular/meatal, T3a-filling the cerebellopontine cistern, T3b-reaching the brainstem, T4a-compressing the brainstem, and T4b-severely dislocating the brainstem and compressing the fourth ventricle. Gardner-Robertson scale for hearing preservation. Given the importance of hearing preservation as a primary outcome, the Gardner-Robertson (GR)39 scale for hearing preservation after surgical resection was developed by Gardner and Robertson in their survey of the existing AN surgical series in 1988. The authors developed this scale to provide audiometric criteria for the classification of hearing preservation into 5 categories. Patients were graded pre- and postoperatively, and their classification was subsequently correlated to their tumor size. Specifically, this scale distinguishes the various levels of hearing of clinical interest beyond “serviceable” vs. “nonserviceable.”39 Serviceable hearing was defined as pure tone audiogram average (PTA) ≤ 50 dB and/or speech discrimination rate of ≥ 50%, corresponding to either GR Class I or II (Table 1). Middle cranial fossa approach. The middle cranial fossa approach allows some hearing preservation, as well as direct access to the lateral end of the IAC to safely remove the most lateral part of the tumor. It has the advantage of gross total resection in addition to facial nerve function preservation (78%),45,46 and is a good option for small tumors (< 1.5 cm), but at the cost of only moderate hearing preservation. Risk of CSF leak is low; however, depending on tumor location, complete removal may not be feasible. Translabyrinthine approach. The advantages of the translabyrinthine approach include shorter distance to access the tumor, avoidance of cerebellar retraction, and early identification of the facial nerve at the lateral end of the IAC.1 This approach is good for anatomic facial nerve preservation while inevitably sacrificing hearing in the process, typically reserved for large tumors (> 3.0 cm) and recommended by some for patients who are deaf or have poor chances of hearing preservation.47 It also has good results with regard to mortality and morbidity,48 with the lowest morbidity associated with spinal fluid leaks and postoperative headache.47 By contrast, this approach has a higher incidence of CSF fistulas and infection, particularly meningitis, in large tumors with hydrocephalus49 compared to the middle cranial fossa approach. The population most likely to benefit from surgery as primary treatment includes patients with larger tumors or those who are symptomatic, especially if the patient can tolerate the risks of surgery or requires immediate symptomatic relief. Beyond these indications for surgery, there is some ambiguity and degree of provider and patient preference influencing the decision to perform surgery instead of radiation. Radiation therapy. Radiation therapy (RT) options include several different types of stereotactic radiotherapy, including FSR applied over multiple sessions, and SRS administered in a single session. Fractionated stereotactic radiation therapy will be discussed in a later section. Cyberknife,53 (Accuray, Sunnyvale, California) permitting a staged approach with improved tumor dose homogeneity, and proton beam54 radiosurgery, with its dose distribution advantage, are other options used for patients with nonserviceable hearing and tumors < 2.0 cm, and are used at some centers. The goal of stereotactic radiotherapy in AN management is to prevent further tumor growth; preserve existing function, particularly hearing; and to reduce or avoid the morbidity associated with open surgery. The dose threshold above which hearing preservation rates decrease is 13 Gy, making this the upper limit of therapy, particularly for patients with intact hearing. Useful or intact hearing was defined as GR Class I (specifically speech discrimination scores of ≥ 80% and/or PTA < 20 dB) by Kano et al,59 and as GR Class I or II by Iwai et al, with the latter specification more commonly cited.60 Toxicities with SRS include trigeminal neuropathy or hyperesthesia and facial nerve neuropathy or palsy, all of which have been reported in < 5% of patients. Notably, despite the overall high rate of hearing preservation with SRS, hearing deficit is still a possible toxicity, with useful hearing preserved in only 40% to 60% of all patients. Several studies have demonstrated the efficacy and safety of stereotactic radiotherapy in the management of AN. Modifications in dosing schedule and prescription, including lower marginal doses, and advancements in technique, including more sophisticated treatment planning software and use of MRI-based targeting, have allowed for reduction in cranial nerve complications following FSR with similar tumor control rates as external-beam fractionated radiotherapy and SRS.63 A Harvard retrospective study63 examined 70 patients with AN (47% newly diagnosed, 31% postoperative, 19% recurrent) treated with conventionally fractionated FSR with a median dose of 54 Gy in 30 fractions to 95% isodose line. Median tumor volume in this group was 2.4 cm3 and median follow-up was 3.8 years. Results demonstrated 5-year local control at 98%, freedom from resection at 92%, freedom from any neurosurgical intervention at 97% if initial tumor volume is < 8.0 cm3 and 47% if ≥ 8.0 cm3. Preservation rates of facial nerve and trigeminal nerve at 3 years were 99% and 96%, respectively. Surgery before FSR was predictive of trigeminal nerve toxicity (86% vs. 98%). Conventionally fractionated FSR resulted in favorable outcomes in this group, which included those with NF-2 as well as sporadic AN; intracanalicular and extracanalicular tumors; presenting after conservative management with observation, tumor progression, or history of 1-3 surgical resections; as well as a range of tumor volumes (0.05-21.1 cm3). While the variety of patients included is encouraging for future generalizability of this study, the superior outcomes in patients with smaller (< 8.0 cm3) tumors most strongly supports the benefit of FSR in treating smaller tumor volumes. Only a few studies have evaluated the safety of SRS as an alternative to surgical resection for older patients or those with medical comorbidities precluding surgery, but who may prefer or benefit from intervention over observation.32 This is particularly salient given evidence of slow growth and even good hearing outcomes in a significant number of untreated AN cases.21,64 A meta-analysis of observation as a management strategy included 26 studies with 1340 patients total, in which tumor growth was observed in 46% of patients (mean growth rate: 1.2 mm/year). Subsequent active treatment was required by only 18% of patients receiving RT.65 An observational study by Breivik and colleagues66 sought to compare SRS with the natural course of AN progression. Over the course of almost 5 years, there was a significant reduction in tumor volume in the RT group, in which need for additional treatment was reduced, compared to the observation group.66 This was done without compromising hearing. These results suggest that AN growth rate, and thereby incidence rate of future retreatment, can be controlled by RT in unilateral, small-to-moderately sized extracanalicular/extrameatal tumors, including those > 2.0 cm in this study. A study by Boari et al43 assessed the safety and efficacy of SRS as primary treatment in patients ages 23-85 years (mean 59 years) with sporadic AN, and found tumor control to be 97.1% in patients, as well as low morbidity associated with SRS. This group concluded that younger GR Class I patients (pure tone audiogram average 0-30 dB, speech discrimination 70% to 100%) had a significantly higher probability of retaining functional hearing, even at 10-year follow-up. Parameters considered as determinants of the clinical outcome were long-term tumor control, hearing preservation, and complications. They recommended that the time between symptom onset, diagnosis, and treatment be shortened given that observation carries the risk of irreversible hearing deterioration in patients with serviceable hearing prior to SRS, particularly in younger patients. Several groups have prospectively compared surgery and SRS. Data from the Mayo Clinic found that among patients with tumors < 3.0 cm, SRS and surgery had similar tumor control rates (100% vs. 96%) but found worse quality of life after surgery (Table 2).44,68 A meta-analysis by Maniakas et al included 16 studies yielding 1292 patients and dating from 1979-2011, with comparable length of follow-up, among which nearly all radiosurgery patients received SRS. Based on pooled results, overall tumor control rate in the SRS group was seen in 96.2% compared to the recurrence-free rate of 98.7% in the microsurgical resection subgroup.51 Literature also reports that complications are significantly higher after microsurgery, even for small tumors < 2.0 cm.69 A review by Sarmiento et al reported that evidence from level 2 studies shows SRS (40% to 68%) results in higher rates of serviceable hearing compared to surgery (0% to 5%), and higher rates of facial nerve preservation (SRS 98% to 100% compared to surgery 66% to 83%) in patients with tumors < 3.0 cm.67 The Maniakas review showed that SRS had better long-term hearing preservation compared to microsurgical resection from any approach (70.2% SRS vs. 50.3% microsurgical resection).51 Furthermore, patients in the radiosurgical group had significantly lower mean Dizziness Handicap Inventory (DHI) scores, suggesting fewer problems with imbalance. Patients who underwent surgical resection experienced significant decline in several of the subsets of the Health Status Questionnaire (HSQ) used to assess quality of life at 3 months, 1 year, and last follow-up, particularly in the “physical functioning” and “bodily pain” categories, while those who underwent radiosurgery had no decline on any component of the HSQ.44 French data demonstrated the largest prospective study comparing surgery to SRS.70 This nonrandomized prospective series used pre- and postoperative questionnaires to evaluate functional outcomes after SRS or microsurgical resection in patients who received only one of these approaches as their primary treatment for unilateral AN. The minimum follow-up was 3 years. These results found that functional side effects occurred during the first 2 years after SRS, and that after 4 years of follow-up, patients receiving SRS had better overall function compared to those receiving microsurgery (Table 3).70 There was no significant difference found between the 2 modalities for post-intervention tinnitus, vertigo or imbalance. A retrospective study by Karpinos et al71 also explored outcomes in patients receiving either SRS or microsurgery, with similar results. Stereotactic radiosurgery was found to be significantly more effective than microsurgery in preserving any measurable hearing defined by GR Scale I-IV (57.5% vs. 14.4%). At long-term follow-up, patients in the SRS group experienced significantly more tinnitus than microsurgical patients (26.5% vs. 0%), while the microsurgery group had a significantly higher rate of facial neuropathy (35.3% vs. 6.1%), classified according to the House-Brackmann grading system, and trigeminal neuropathy (22% vs. 12.2%). The microsurgery group also had significantly higher peri-operative (immediate post-intervention) complications (47.8% vs. 4.6%) and hospital stay compared to the SRS group. However, there was no post-intervention difference in worsening imbalance, dysarthria, dysphagia, headache, or functional level71 (as defined by the Karnofsky Performance Scale and Eastern Cooperative Oncology Group scale). A retrospective study by Andrews et al also compared SRS (dose 12 Gy) to FSR (mean dose 50 Gy in 25 fractions) in AN in 125 patients in a single-institution study for a mean follow-up of 2.3 years. Tumor control was found to be 98% for SRS compared to 97% for FSR. Toxicity was comparable for CN V (95% for SRS vs. 93% for FSR) and CN VII (98% for both SRS and FSR) preservation. However, in patients with sporadic AN and pre-intervention serviceable hearing, functional hearing was statistically significantly different, 33% in SRS group vs. 81% in the conventionally fractionated FSR group.12 This rate was described as superior not only to SRS, but also microsurgery and the natural history of AN progression. Patients with GR Grade I hearing had a significantly higher probability of preserving functional hearing than did GR Grade II patients (especially among patients receiving FSR). This suggests the importance of early intervention in preserving hearing, specifically immediate treatment of GR Grade I patients with FSR to maximize probability of hearing preservation.79 The results of this series were compared to other studies measuring post-treatment serviceable hearing in patients receiving either SRS or FSR, which demonstrated comparable rates (Table 4). Combs et al performed one study evaluating the effectiveness and long-term outcome of SRS for AN,31 and another assessing the long-term outcome and toxicity of FSR for AN.77 Actuarial local tumor control rates at 3 and 5 years after FSR and SRS were comparable (Table 4). Two patients receiving SRS developed tumor progression at 36 and 48 months. Actuarial useful hearing preservation was 94% at 5 years for patients with pre-intervention useful hearing (Table 4). The hearing preservation rate in patients with useful hearing before SRS was 55% at 9 years. However, they discuss the importance of studying variation in hearing preservation, as it is the most common presenting symptom of symptomatic patients and one of the most valuable post-intervention outcomes. In addition, Combs et al cite existing studies at time of publication comparing FSR to SRS, demonstrating comparable local control and CN V and VII toxicity rates (Table 4). Cranial nerve toxicity other than hearing impairment was rare in this study. Among those at risk of treatment-related facial nerve toxicity, one patient developed a complete facial nerve palsy after SRS (5%). A total of 93% of the lesions treated were at risk of radiation-induced trigeminal neuralgia, and two of these patients (8%) developed mild dysesthesia of the trigeminal nerve after SRS. Due to differences in study population, tumor assessment, definitions used for hearing preservation, follow-up times, and treatment techniques, comparison of these series cannot reliably detect small differences between FSR and SRS outcomes and toxicities.74 There has also been some evidence that at longer follow-up intervals, there appears to be lower rates of hearing preservation compared to preliminary studies that suggested superiority of FSR for this outcome.44 Finally, toxicity associated with SRS has decreased since the introduction of lower doses of radiation. Overall, evidence shows comparable rates of hearing preservation, local tumor control, and radiation-associated side effects between FSR and SRS, allowing for institutional experience and patient preference to guide the chosen modality. It is also worth noting the lack of randomized studies comparing FSR to SRS techniques, as a possible area of future study. Tumor volume has been shown in some studies to be a better indicator of response to SRS than maximum tumor diameter, which is the measurement currently cited in studies making treatment recommendations. Yang et al examined AN control with SRS, and after 36 months found that 16 tumors (25%) had a volume reduction of more than 50%, 22 (35%) tumors had a volume reduction of 10% to 50%, 18 (29%) were stable in volume (volume change < 10%), and 7 (11%) had larger volumes (5/7 patients underwent resection and 1/7 underwent repeat SRS). In univariate analysis at 2 years, patients who had a previous resection, those with a tumor volume exceeding 10 ml, those with Koos Grade Classification86 4 tumors, and pre-SRS facial weakness, had significantly lower likelihood of tumor control after SRS.56 In multivariate analysis, patients with no history of a resection and with Koos Classification Grade 3 tumor extension had better tumor control.56 RECIST (Response Evaluation Criteria in Solid Tumors) guidelines87 are tumor-centric criteria published to define when tumors improve (“respond”), stay essentially unchanged by (“stabilize”), or worsen (“progress”) during the course of treatment. These outcome assessments are determined based on evaluation of target lesions for degree of response: complete response (disappearance of all target lesions), partial response (≥ 30% decrease in the sum of the longest diameter (LD) of target lesions), stable disease (neither sufficient shrinkage nor increase compared to smallest sum of LD of lesions), and progressive disease (≥ 20% increase in the sum of LD of target lesions). There is no international consensus on the optimal treatment for AN.7 Likewise, there are presently no guidelines on the effectiveness and safety of SRS compared to observation or microsurgical resection. Many papers and review articles describe satisfactory tumor growth control and few side effects with stereotactic radiotherapy.13,72 But despite these promising results, there is no clear evidence that this treatment modality is superior to microsurgical resection. To date, there are no prospective randomized controlled trials comparing conservative management with observation, microsurgical resection, and stereotactic radiotherapy.7 Prospective evaluation of these modalities in a comparable population of patients who could opt for any of these modalities is needed. Ideally, these studies would be performed in a single institution setting with the same physician performing resection as being involved with RT to minimize inter-practitioner bias.44 By examining outcomes in patients presenting with symptoms as well as those with incidentally discovered AN in the small-to-medium range, more consistent recommendations can be made on how to optimally treat these populations in an interdisciplinary fashion. Samii M. Vestibular Schwannomas. In: Sindou M, ed. Practical Handbook of Neurosurgery. Vienna, Austria: Springer-Verlag Wien; 2009:833-847. Stangerup SE, Caye-Thomasen P. Epidemiology and natural history of vestibular schwannomas. Otolaryngol Clin North Am. 2012;45(2):257-268, vii. Cohen RJ. Acoustic neuroma: summary of the NIH consensus. Md Med J. 1992;41(12):1128-1130. Lin D, Hegarty JL, Fischbein NJ, Jackler RK. The prevalence of “incidental” acoustic neuroma. Arch Otolaryngol Head Neck Surg. 2005;131(3):241-244. House WF, Hitselberg WE. Acoustic tumors. In: Vinken PJ, Bruyn GW, eds. Handbook of Clinical Neurology. New York, NY: Elsevier; 1974:666-692. Hart RG, Davenport J. Diagnosis of acoustic neuroma. Neurosurgery. 1981;9(4):450-463. Muzevic D, Legcevic J, Splavski B, Caye-Thomasen P. Stereotactic radiotherapy for vestibular schwannoma. The Cochrane database of systematic reviews. 2014;12:CD009897. Berkowitz O, Iyer AK, Kano H, et al. Epidemiology and environmental risk factors associated with vestibular schwannoma. World Neurosurg. 2015 Dec;84(6):1674-80. Matthies C, Samii M. Management of 1000 vestibular schwannomas (acoustic neuromas): Clinical presentation. Neurosurgery. 1997;40:1-9; discussion 9-10. Frisch CD, Eckel LJ, Lane JI, Neff BA. Intralabyrinthine Schwannomas. Otolaryngol Clin North Am. Jun 2015;48(3):423-441. Sughrue ME, Kaur R, Rutkowski MJ, et al. A critical evaluation of vestibular schwannoma surgery for patients younger than 40 years of age. Neurosurg. 2010;67(6):1646-1653; discussion 1653-1644. Andrews DW, Suarez O, Goldman HW, et al. Stereotactic radiosurgery and fractionated stereotactic radiotherapy for the treatment of acoustic schwannomas: comparative observations of 125 patients treated at one institution. Int J Radiat Oncol Biol Phys. 2001;50(5):1265-1278. Arthurs BJ, Fairbanks RK, Demakas JJ, et al. A review of treatment modalities for vestibular schwannoma. Neurosurg Rev. 2011;34(3):265-277; discussion 277-269. Wade PJ, House W. Hearing preservation in patients with acoustic neuromas via the middle fossa approach. Otolaryngol Head Neck Surg. 1984;92(2):184-193. Welling DB, Glasscock ME, 3rd, Woods CI, Jackson CG. Acoustic neuroma: a cost-effective approach. Otolaryngol Head Neck Surg. 1990;103(3):364-370. Chang Y, Lee SH, Lee YJ, et al. Auditory neural pathway evaluation on sensorineural hearing loss using diffusion tensor imaging. Neuroreport. 2004;15(11):1699-1703. Lin Y, Wang J, Wu C, et al. Diffusion tensor imaging of the auditory pathway in sensorineural hearing loss: changes in radial diffusivity and diffusion anisotropy. J Magn Reson Imaging. 2008;28(3):598-603. Wu CM, Ng SH, Liu TC. Diffusion tensor imaging of the subcortical auditory tract in subjects with long-term unilateral sensorineural hearing loss. Audiol Neurotol. 2009;14(4):248-253. Salzman KL, Davidson HC, Harnsberger HR, et al. Dumbbell schwannomas of the internal auditory canal. Am J Neuroradiol. 2001;22(7):1368-1376. Hansasuta A, Choi CY, Gibbs IC, et al. Multisession stereotactic radiosurgery for vestibular schwannomas: single-institution experience with 383 cases. Neurosurgery. 2011;69(6):1200-1209. Varughese JK, Breivik CN, Wentzel-Larsen T, Lund-Johansen M. Growth of untreated vestibular schwannoma: a prospective study. J Neurosurg. 2012;116(4):706-712. Sampath P, Rhines L, Goel R, Long D. Cranial nerve preservation in contemporary vestibular schwannoma (acoustic neuroma) treatment. Crit Rev Neurosurg. 1998;8(2):86-96. Gauden A, Weir P, Hawthorne G, Kaye A. Systematic review of quality of life in the management of vestibular schwannoma. J Clinical Neurosci. 2011;18(12):1573-1584. Gormley WB, Sekhar LN, Wright DC, et al. Acoustic neuromas: results of current surgical management. Neurosurgery. 1997;41(1):50-58; discussion 58-60. Samii M, Matthies C. Management of 1000 vestibular schwannomas (acoustic neuromas): the facial nerve—preservation and restitution of function. Neurosurgery. 1997;40(4):684-694; discussion 694-685. Samii M, Rosahl SK, Tatagiba MS. Microsurgical removal of a petrous apex meningioma after stereotactic radiation: technical case report. Neurosurgery. 2001;49(1):216-219; discussion 219-220. Guerin C, Sampath P, Long DM. Acoustic neuroma: outcome of surgical resection and study on the anatomy of facial and cochlear nerves. Ann Acad Med Singapore. 1999;28(3):402-408. Battaglia A, Mastrodimos B, Cueva R. Comparison of growth patterns of acoustic neuromas with and without radiosurgery. Otol Neurotol. 2006;27(5):705-712. Leksell L. A note on the treatment of acoustic tumours. Acta Chir Scand. 1971;137(8):763-765. Lederman G, Lowry J, Wertheim S, et al. Acoustic neuroma: potential benefits of fractionated stereotactic radiosurgery. Stereotac Funct Neurosurg. 1997;69:175-182. Combs SE, Thilmann C, Debus J, Schulz-Ertner D. Long-term outcome of stereotactic radiosurgery (SRS) in patients with acoustic neuromas. Int J Radiat Oncol Biol Phys. 2006;64(5):1341-1347. Hasegawa T, Kida Y, Kato T, et al. Long-term safety and efficacy of stereotactic radiosurgery for vestibular schwannomas: evaluation of 440 patients more than 10 years after treatment with Gamma Knife surgery. J Neurosurg. 2013;118(3):557-565. Litre F, Rousseaux P, Jovenin N, et al. Fractionated stereotactic radiotherapy for acoustic neuromas: a prospective monocenter study of about 158 cases. Radiother Oncol. 2013;106(2):169-174. Hasegawa T, Kida Y, Kobayashi T, et al. Long-term outcomes in patients with vestibular schwannomas treated using gamma knife surgery: 10-year follow up. J Neurosurg. 2013;119 Suppl:10-16. Lunsford LD, Niranjan A, Flickinger JC, et al. Radiosurgery of vestibular schwannomas: summary of experience in 829 cases. J Neurosurg. 2005;102:195-199. Plotkin SR, Merker VL, Halpin C, et al. Bevacizumab for progressive vestibular schwannoma in neurofibromatosis type 2: a retrospective review of 31 patients. Otol Neurotol. 2012;33(6):1046-1052. Mautner VF, Nguyen R, Kutta H, et al. Bevacizumab induces regression of vestibular schwannomas in patients with neurofibromatosis type 2. Neuro Oncol. 2010;12(1):14-18. Plotkin SR, Stemmer-Rachamimov AO, Barker FG, 2nd, et al. Hearing improvement after bevacizumab in patients with neurofibromatosis type 2. N Engl J Med. 2009;361(4):358-367. Gardner G, Robertson JH. Hearing preservation in unilateral acoustic neuroma surgery. Ann Otol Rhinol Laryngol. 1988;97(1):55-66. Samii M, Matthies C. Management of 1000 vestibular schwannomas (acoustic neuromas): hearing function in 1000 tumor resections. Neurosurgery. 1997;40(2):248-260; discussion 260-242. Samii M, Matthies C. Management of 1000 vestibular schwannomas (acoustic neuromas): surgical management and results with an emphasis on complications and how to avoid them. Neurosurgery. 1997;40(1):11-21; discussion 21-13. Samii M, Gerganov VM. 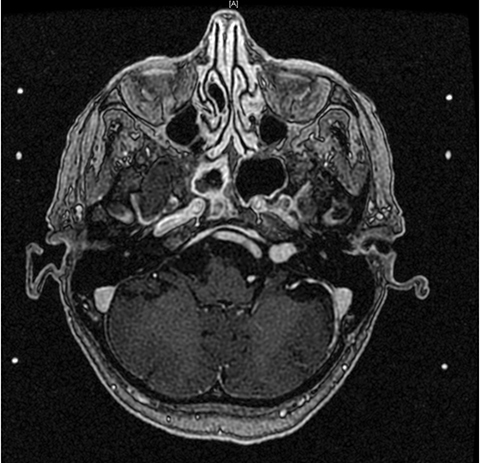 Vestibular Schwannomas. In: Bernstein M, Berger MS, eds. Neuro-Oncology: The Essentials. 2 ed. New York, NY: Thieme. 2011:353-358. Boari N, Bailo M, Gagliardi F, et al. Gamma Knife radiosurgery for vestibular schwannoma: clinical results at long-term follow-up in a series of 379 patients. J Neurosurg. 2014;121 Suppl:123-142. Pollock BE, Driscoll CL, Foote RL, et al. Patient outcomes after vestibular schwannoma management: a prospective comparison of microsurgical resection and stereotactic radiosurgery. Neurosurgery. 2006;59:77-85; discussion 77-85. Mazzoni A, Calabrese V, Danesi G, De Nigris M. The sub-occipital approach in functional surgery of acoustic neuroma. Acta Otorhinolaryngolog Ital. 1993;13(1):3-11. Haid CT, Wigand ME. Advantages of the enlarged middle cranial fossa approach in acoustic neurinoma surgery. A review. Acta Otolaryngol. 1992;112(3):387-407. Brackmann DE, Green JD. Translabyrinthine approach for acoustic tumor removal. Otolaryngol Clin North Am. Apr 1992;25(2):311-329. Chen JM, Fisch U. The transotic approach in acoustic neuroma surgery. J Otolaryngol. 1993;22(5):331-336. Briggs RJ, Shelton C, Kwartler JA, Hitselberger W. Management of hydrocephalus resulting from acoustic neuromas. Otolaryngol Head Neck Surg. 1993;109(6):1020-1024. Glasscock ME, 3rd, Hays JW, Minor LB, et al. Preservation of hearing in surgery for acoustic neuromas. J Neurosurg. 1993;78(6):864-870. Maniakas A, Saliba I. Microsurgery versus stereotactic radiation for small vestibular schwannomas: a meta-analysis of patients with more than 5 years’ follow-up. Otol Neurotol. 2012;33(9):1611-1620. Cohen NL, Lewis WS, Ransohoff J. Hearing preservation in cerebellopontine angle tumor surgery: the NYU experience 1974-1991. Am J Otol. 1993;14(5):423-433. Vernimmen FJ, Mohamed Z, Slabbert JP, Wilson J. Long-term results of stereotactic proton beam radiotherapy for acoustic neuromas. Radiother Oncol. 2009;90(2):208-212. Foote KD, Friedman WA, Buatti JM, et al. Analysis of risk factors associated with radiosurgery for vestibular schwannoma. J Neurosurg. 2001;95(3):440-449. Yang HC, Kano H, Awan NR, et al. Gamma Knife radiosurgery for larger-volume vestibular schwannomas. Clinical article. J Neurosurg. Mar 2011;114(3):801-807. Niranjan A, Gobbel GT, Kondziolka D, et al. Experimental radiobiological investigations into radiosurgery: present understanding and future directions. Neurosurgery. 2004;55(3):495-504; discussion 504-495. Chao ST, Thakkar VV, Barnett GH, et al. Prospective study of the short-term adverse effects of gamma knife radiosurgery. Technol Cancer Res Treat. 2012;11(2):117-122. Iwai Y, Yamanaka K, Shiotani M, Uyama T. Radiosurgery for acoustic neuromas: results of low-dose treatment. Neurosurgery. 2003;53(2):282-287; discussion 287-288. Kim KM, Park CK, Chung HT, et al. Long-term Outcomes of Gamma Knife Stereotactic Radiosurgery of Vestibular Schwannomas. J Korean Neurosurg Soc. 2007;42(4):286-292. Huang CF, Tu HT, Lo HK, et al. Radiosurgery for vestibular schwannomas. J Chin Med Assoc. 2005;68(7):315-320. Chan AW, Black P, Ojemann RG, et al. Stereotactic radiotherapy for vestibular schwannomas: favorable outcome with minimal toxicity. Neurosurgery. 2005;57(1):60-70; discussion 60-70. Breivik CN, Varughese JK, Wentzel-Larsen T, et al. Conservative management of vestibular schwannoma—a prospective cohort study: treatment, symptoms, and quality of life. Neurosurgery. 2012;70(5):1072-1080; discussion 1080. Yoshimoto Y. Systematic review of the natural history of vestibular schwannoma. J Neurosurg. 2005;103(1):59-63. Breivik CN, Nilsen RM, Myrseth E, et al. Conservative management or gamma knife radiosurgery for vestibular schwannoma: tumor growth, symptoms, and quality of life. Neurosurgery. 2013;73(1):48-56; discussion 56-47. Sarmiento JM, Patel S, Mukherjee D, Patil CG. Improving outcomes in patients with vestibular schwannomas: microsurgery versus radiosurgery. J Neurosurg Sci. 2013;57(1):23-44. Pollock BE. Management of vestibular schwannomas enlarged after stereotactic radiosurgery: treatment recommendations based on a 15 year experience. Neurosurgery. 2006;58:241-248; discussion 241-248. Nonaka Y, Fukushima T, Watanabe K, et al. Contemporary surgical management of vestibular schwannomas: Analysis of complications and lessons learned over the past decade. Neurosurgery. 2013;72:103-115; discussion 115. Regis J, Pellet W, Delsanti C, et al. Functional outcome after gamma knife surgery or microsurgery for vestibular schwannomas. J Neurosurg. 2002;97(5):1091-1100. Karpinos M, Teh BS, Zeck O, et al. Treatment of acoustic neuroma: stereotactic radiosurgery vs. microsurgery. Int J Radiat Oncol Biol Phys. 2002;54(5):1410-1421. Mendenhall WM, Friedman WA, Amdur RJ, Antonelli PJ. Management of acoustic schwannoma. Am J Otolaryngol. 2004;25(1):38-47. Prasad D, Steiner M, Steiner L. Gamma surgery for vestibular schwannoma. J Neurosurg. 2000;92(5):745-759. Meijer OW, Vandertop WP, Baayen JC, Slotman BJ. Single-fraction vs. fractionated linac-based stereotactic radiosurgery for vestibular schwannoma: a single-institution study. Int J Radiat Oncol Biol Phys. 2003;56(5):1390-1396. Fuss M, Debus J, Lohr F, et al. Conventionally fractionated stereotactic radiotherapy (FSRT) for acoustic neuromas. Int J Radiat Oncol Biol Phys. 2000;48(5):1381-1387. Williams JA. Fractionated stereotactic radiotherapy for acoustic neuromas. Int J Radiat Oncol Biol Phys. 2002;54(2):500-504.
ombs SE, Volk S, Schulz-Ertner D, et al. Management of acoustic neuromas with fractionated stereotactic radiotherapy (FSRT): long-term results in 106 patients treated in a single institution. Int J Radiat Oncol Biol Phys. 2005;63(1):75-81. Hasegawa T, Fujitani S, Katsumata S, et al. Stereotactic radiosurgery for vestibular schwannomas: analysis of 317 patients followed more than 5 years. Neurosurgery. 2005;57:257-265; discussion 257-265. Flickinger JC. Observation versus early stereotactic radiotherapy of acoustic neuroma: what are you waiting for? Int J Radiat Oncol Biol Phys. 1999;44(3):481-482. 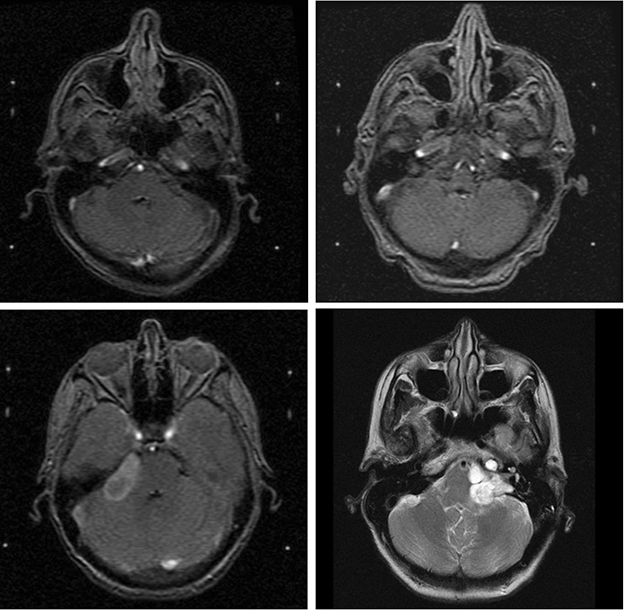 Ito K, Kurita H, Sugasawa K, Mizuno M, Sasaki T. Analyses of neuro-otological complications after radiosurgery for acoustic neurinomas. Int J Radiat Oncol Biol Phys. 1997;39(5):983-988. Nedzi LA, Kooy H, Alexander E, 3rd, et al. Variables associated with the development of complications from radiosurgery of intracranial tumors. Int J Radiat Oncol Biol Phys. 21(3):591-599. Flickinger JC, Kondziolka D, Pollock BE, Lunsford LD. Evolution in technique for vestibular schwannoma radiosurgery and effect on outcome. Int J Radiat Oncol Biol Phys. 1996;36(2):275-280. Kondziolka D, Lunsford LD, McLaughlin MR, Flickinger JC. Long-term outcomes after radiosurgery for acoustic neuromas. N Engl J Med. 1998;339(20):1426-1433. Varlotto JM, Shrieve DC, Alexander E, 3rd, et al. Fractionated stereotactic radiotherapy for the treatment of acoustic neuromas: preliminary results. Int J Radiat Oncol Biol Phys. 1996;36(1):141-145. Bassim MK, Berliner KI, Fisher LM, et al. Radiation therapy for the treatment of vestibular schwannoma: a critical evaluation of the state of the literature. Otol Neurotol. 2010;31(4):567-573. Koos WT, Day JD, Matula C, Levy DI. Neurotopographic considerations in the microsurgical treatment of small acoustic neurinomas. J Neurosurg. 1998;88(3):506-512. Saadatmand HJ, Cheng-Chia W, Wang TJC. Interdisciplinary management of acoustic neuromas. Appl Rad Oncol. 2016;5(1):5-16. Miss Saadatmand is a fourth-year medical student, Dr. Wu is a resident physician in radiation oncology, and Dr. Wang is assistant professor of radiation oncology, all in the Department of Radiation Oncology, College of Physicians and Surgeons, Columbia University Medical Center, New York, NY. Miss Saadatmand and Dr. Wu are co-first authors.